How are you this week? Are you feelin’ the Fall vibes yet? I’m so happy for it to finally be September and Fall-O-Ween season (it’s Fall and Halloween decoration time, ha!). The last couple weeks were acorns but this week it’s all about a Halloween design, sort of. 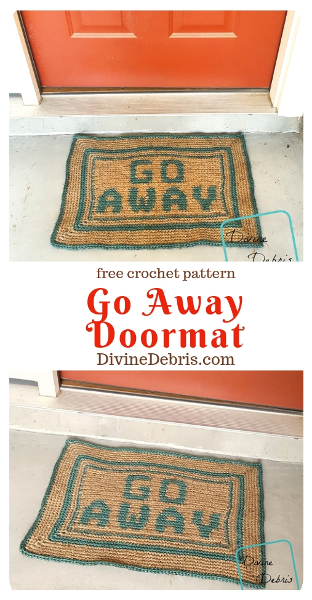 I have always wanted to make a doormat, especially once I started making tapestry designs, and when I was at Lowe’s recently I saw their jute twines and finally went for it. I love the way it turned out, it’s awesome and I can’t wait for someone to right the doorbell… but it was hard on my hands to work with the twine. It made me really appreciate the yarn when I went back to working on another Fall-O-Ween design. I really hope you all like this design and find the humor in it, because it’s supposed to be received as funny not mean. You can purchase an ad-free downloadable pdf for this pattern in my Ravelry shop. Needle you can use to weave in your ends. 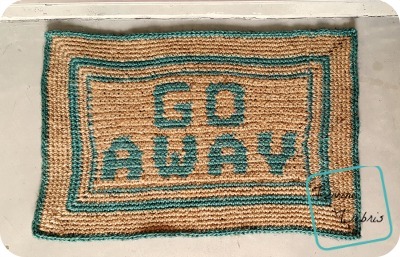 This pattern is worked in 2 sections – the main body, where the words are, and then the border. This pattern is worked back and forth, with a turn at the end or the beginning of the row, during the first section and then in the round with a slip st into the first st from the last st.
You can replace the chain row (row 1) with a foundation single crochet row. Color A is tan and color B is green in the photos. Every stitch in this pattern is a single crochet. The directions for the sides portion (where the graphing is) will only tell you what color (ie: Color A, Color B, etc…) and the number in the parentheses tells you how many stitches to make. I sprayed the back of this rug with Plasti Dip to make it less slippery. It took a couple coats and it worked really well. 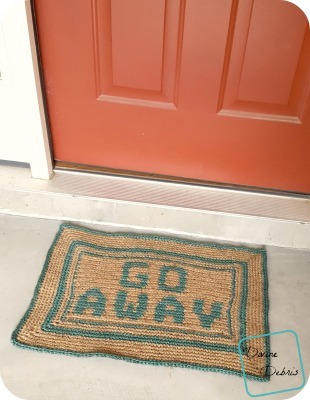 You might need to block this a little bit or just not worry about it, because it is a doormat. I did a couple coats of Plasti Dip to make the back of the mat slip resistant and it helped to flatten and straighten it out. This post is linked to Hookin’ on Hump Day #151.